Tuesday we drove from mountains to ocean. It took almost ten hours, with a stop for lunch. North Carolina is a really long state. Once we descended into the piedmont, some trees had tiny leaves, not just buds, and all along the road there were small purple flowering trees, maybe Eastern redbuds, based on my Googling. We had lunch at a diner where Beth and I between us had cornbread, a biscuit, fried green tomatoes, fried okra, sweet potato fries, cole slaw, macaroni and cheese, and peanut butter pie. When after a moment of hesitation, I added sweet tea to my order, Beth said I was going for “the full Southern.” It was all very good. By mid-afternoon the trees were mostly pines and by late afternoon, there was water in ditches all along the road, presumably dug there to drain the swampy land. Then we started crossing broad rivers and sounds on long, narrow bridges with seagulls wheeling overhead and then we were in the Outer Banks. The house was a classic Outer Banks house on stilts, right on the beach, with an upper and lower deck in the front, plus two landing-type decks in the back. 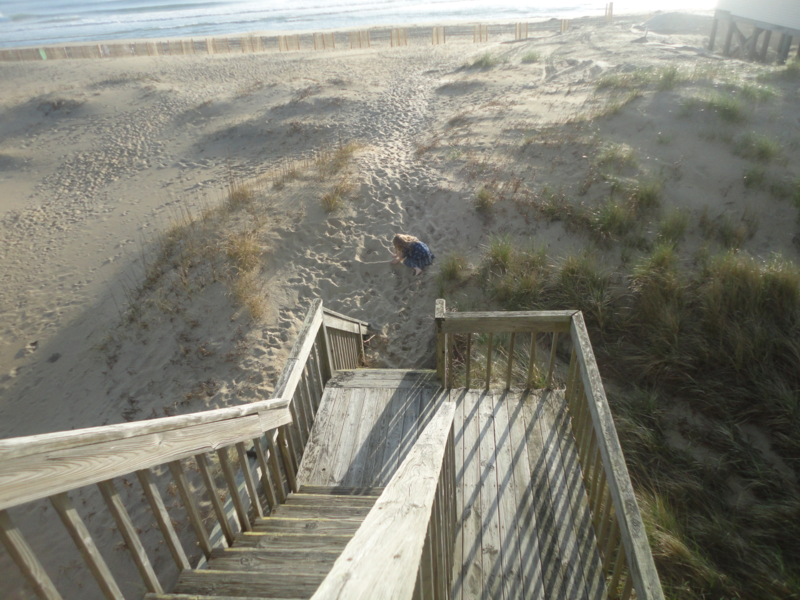 You could walk straight off the front decks onto the beach, which caused June to exclaim over and over, “This house is literally on the beach.” She liked being able to play in the sand whenever she wanted and in fact had started building a sand castle while we were still doing our settling in chores and the next morning right after breakfast, she was at it again. It was just after seven when we arrived so I needed to feed the kids and get sheets on the beds and make sure June took a bath while Beth made a quick grocery run. 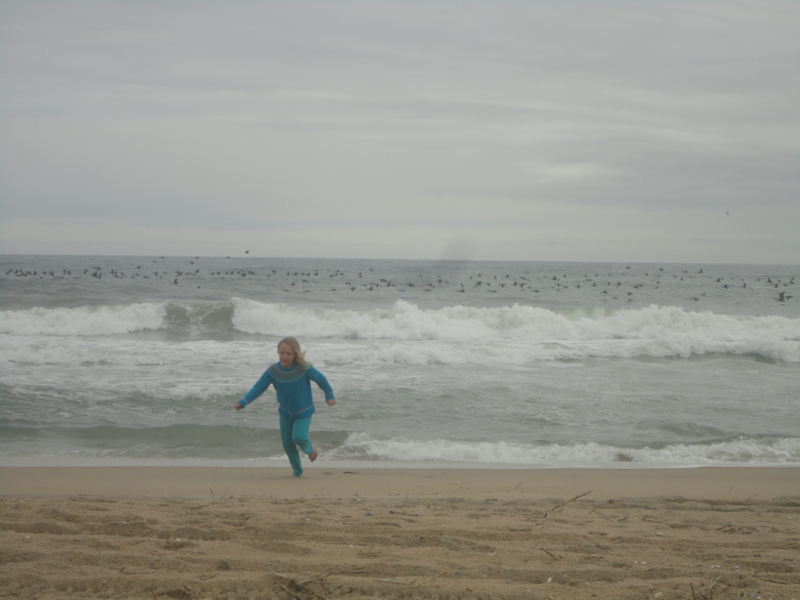 But June and I did steal ten minutes between all that to stand with our feet in the waves in the falling dusk. That night we fell asleep with the windows open, listening to the crashing waves. At 8:45 the next morning, June and I were having a picnic breakfast (cucumber slices for her and an Easter egg for me) on the beach. It was a second breakfast, as we’d eaten the first one on the upper deck, from which we saw both pelicans and dolphins. That was the only time we saw dolphins but there were pelicans flying over the ocean in front of the house all the time. In fact, I started calling the deck Café Pelican because I ate so many meals there and saw so many pelicans, in the hundreds no doubt. Around 9:15 it started to rain—intermittent rain was predicted for the next two days—and we went back to the house. I put on my raincoat and took a walk to the fishing pier. It was about a half hour walk from the house so it made a good focal point for a stroll. I found a piece of driftwood with large barnacles on it, some pretty shells, and a red, white, and blue crab leg. I pocketed the shells and leg to take back to show June. While I was walking it started to rain harder and I ended up getting pretty wet. When I got to the pier, I stood under it, sheltering from the rain and watching the waves break around the pilings. When the rain let up, I walked out on the pier. It should have cost $1.50, but for some reason they didn’t charge me. There were little gaps between the boards, so you could see the swirling water far below you, which was a bit unsettling, and the pier itself creaked and swayed ever so slightly in the wind. I was there so soon after the deluge, I had it to myself for a while but eventually some people came to fish. I went home, changed into dry clothes, and read Return of the Dragon to June on the deck. After lunch, I straightened up the kitchen and made a grocery list for Beth. She went shopping while June and I went to the beach again. It had stopped raining, but a cold fog had rolled in. June was intrigued by my description of the pier and she wanted to see it so we made the whole walk over again. As we approached, she got a little nervous about being so high up and she asked if there was a rail. Once I said there was, she said she’d be fine. She did peer at the ocean between the gaps in the boards and she was a bit horrified people were fishing on a fishing pier. (“I don’t want to see any dead or dying fish!” she said. I advised her not to look in the buckets.) We sat on a bench at the very end of the pier and watched the gentle swells of the water beyond the breakers. We came home and relaxed the rest of the afternoon, all of us but Noah that is; he was doing homework. That evening he finished a big project for his media class. It’s a website for a fictional pasta company, Noah’s Noodles. It’s basically what he’s been doing with his weekends for the past couple months. Check it out but don’t actually order any noodles. They don’t exist. It got cold that evening so we had to close all the windows and turn on the heat, after trying to tough it out by wearing sweatshirts and wrapping ourselves in blankets so we could still hear the ocean. It rained that night and there was a brief but intense downpour in the morning. When it let up a bulldozer started moving sand around in front of the house. It looked like it was making a driveway for a neighboring house. It almost made me wish we had a preschooler to appreciate the show. Around 9:40 I headed out to the beach with a copy of Anna Karenina, a towel and a thermos of hot tea. There was a chair on the beach not far from the house so I sat there, covering it with the towel and propping an umbrella up over my book during a passing shower. While I was there an enormous flock of migratory birds, black, smaller than gulls and long-necked, flew north just over the water. It took at least ten minutes for them to pass. June came down from the house to watch them and play on the beach while I read. 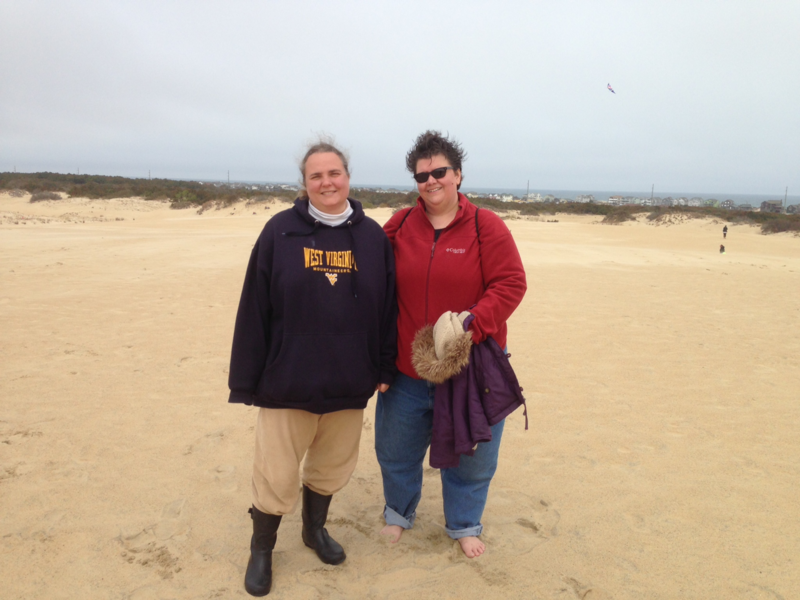 After lunch we visited Jockey’s Ridge State Park to climb the tallest natural sand dune on the East Coast. 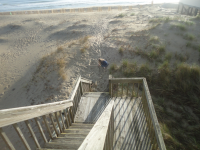 We took a nature trail down to the sand, through a small pine wood and back up onto the dune. It was a fun hike, with nice ocean and sound views, and eerie vistas of twisted, windswept trees. June was full of energy and running circles around the rest of us. Noah was moody and alternately saying the park was “fun” and “cool” and then glumly complaining about his lack of progress on a history project. He cut his foot on something in the sand (glass perhaps—June found some nearby) and said it was a metaphor. I said yes, because his progress was impeded but he had not sustained a life-threatening injury. It’s not easy being thirteen going on fourteen, I remember that. We did stop on the way home for ice cream—a banana split for me, brownie sundaes for Noah and Beth, and Heath bar flurry for June. I hoped the combination of fresh air and frozen treats would help raise his spirits. I went back to the beach to read more Anna Karenina, coming inside when my hands got too cold to turn the pages. June and I made dinner, scrambled eggs with chopped olives meant to represent a shell-strewn beach and a green asparagus sea. (This was all her idea.) After dinner she and I read more of her book on the beach. She wrapped herself in the beach towel to stay warm. Friday morning—a warm, sunny morning—we packed up the house and dropped off the keys at the realty. Noah and I took a brief walk on the beach while we waited for the dishwasher to finish its cycle. He wanted to go as far as the pier but there wasn’t time. I found a nearly whole conch shell I was going to take back and add to the collection I was leaving on the deck rail for the next people but then I discovered another shell inside and thinking it might contains a tenant, I tossed it back into the sea. Since it was sunny in Nags Head and storms were predicted in Williamsburg, where we were headed next, we decided to spend the rest of the morning and part of the afternoon at the beach before driving north. For the next couple hours we split up. Beth took the kids to play miniature golf and they dropped me at a public access beach. There were a lot more people on this beach—either because there was a parking lot or because it wasn’t fifty degrees and raining I’m not sure. Maybe both. Anyway, the weather was lovely, around seventy and sunny, and the waves were big and scenic. I spent two hours reading and napping and taking a walk. 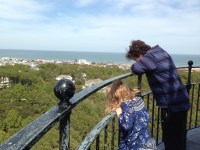 We had lunch at a pizza place on the highway, eating on the patio, and then we drove to the stately red brick Currituck Beach Lighthouse, where we climbed 220 steps to the top and enjoyed the wind and the the beautiful views of sea and sound. 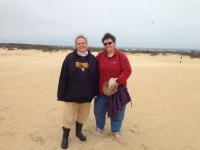 “Some day we are going to be too old to do this,” I said to Beth, after we’d descended. “But that day is not today,” she answered me cheerfully and she was right. Next installment: Bush Gardens and cherry blossoms. This entry was posted in Beach, Travel by Steph. Bookmark the permalink.